The following services are available through the Conservation District in addition to our financial assistance and technical assistance programs to help people who want to do their part in caring for our soil and water resources. The Franklin County Conservation District provides a contractors list as a public service for landowners looking to have various conservation work completed on their land. The Franklin County Conservation District is not responsible for arrangements, quotes, contracts or any other business conducted between landowners and contractors. This information is provided as a public service and constitutes no endorsement by the Franklin County Conservation District. While an effort has been made to provide complete and accurate listing of services, omissions, or other error may occur and therefore other available sources should be consulted. This list is made up of the contractor's who contact our office and request to be on the list. Click here for a list of onsite waste system installers, waste haulers, inspectors, water well drillers and design/soil profile/site assessments contractors licensed with Franklin County. grass, food plots, conservation buffers, pastures, pollinator habitat, house yards and even grains such as wheat, oats, rye, and soybeans. The no-till drill rents for $10.00 per acre (based on the acreage meter) Effective April 3, 2018 the minimum rental charge is $100.00; cash and check only. The drill is available for use in Franklin County only. A minimum 40HP tractor with hydraulic hooks ups is required for using the drill. John Deere tractor owns may need adapters for the hydraulic hose ends. Call 785-241-7201 to schedule the drill for all your seeding needs. Funds generated through drill rental fees and seed sales are used to cover upkeep on drill and to cover replacement costs when needed. County/State tax funds are not used to cover operational expenses, or purchases, of the drill. The Franklin County Conservation District offer to the public custom blended seed mixes for all your erosion control, pasture/hayland enhancement and wildlife habitat needs. 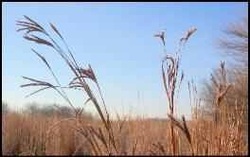 We sell many types of grasses and seed; including traditional native mix of Big Bluestem, Little Bluestem, Indian Grass, Side-oats, Switch Grass as well as Brome, fescue, rye, clover and more. We do not keep seed on hand as each order is custom blended to meet YOUR environmental benefit needs! We work directly with NRCS and FSA to assure the seed we order meet program requirements for CRP, EQIP and pollinator programs under the Federal Farm Bill. 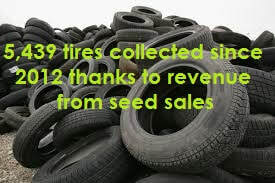 Funding generated form seed sales has allowed the Conservation District to host and fund three tire collection days (2012, 2014 & 2017) where we have paid just over $20,000 to properly dispose of over 5,400 tires without using any county tax dollars or county staff time at the transfer station. Thank you for supporting our seed sales program as we return the benefits right back to you the county landowners! Blue Grama, Buffalo Grass, Eastern Gama Grass, Western Wheatgrass, Annual Ryegrass, Prairie Cordgrass, Prairie Junegrass, Reed Canary, Wild Rye, Alfalfa (grazing type & common), Ladino White Clover, Medium Red Clover and Fescue. Black-eyed Susan; Blanket Flower; Blue Flax; Butterfly Milkweed; Coneflower~ Clasping, Grayhead, Pale Purple, Purple, Upright; Plains Coreopsis; Sunflower ~ False, Maximilian; Illinois Bundle Flower; Indian Blanket; Partridge Pea; Pitcher Sage; Purple Prairie Clover; Wild Bergamont; and Wild Blue Indigo. We are pleased to offer pollinator mixes, honey bee mixes and other specialty blends. We can even order cover crop mixes, blankets, logs and other erosion products. Available in bundles of 100 for $15.00 per bundle. We keep florescent pink on hand and occasionally have blue available also. ​Flags have a 30" wire stake. The Franklin County Conservation District has two Panama Drip Torches available for loan to assist with conducting a controlled burn. Tank capacity is 1 3/8 gallons. Fuel mixture to be used is 1 part gasoline to 4 parts diesel fuel OR 1 quart gasoline to 1 gallon Diesel Fuel. Person borrowing the torch is fully liable for any damage resulting from the fire and cost of suppression, should the fire escape. Make sure the tank is empty before returning it to our office. You must show a copy of your Franklin County Burn Permit when borrowing the drip torches. Permits are available at the Planning & Building Department Office located in the Franklin County Annex at 1428 South Main, Ottawa. 785-229-3570 Burn permits cost $1.00 and are valid one calendar year. There is no charge to borrow our drip torches; they were purchased and are maintained through funds generated through our seed sales. Revenue from seed sales are returned to our programs to benefit Franklin County landowners. file photo from demonstration burn at Pomona Lake. Sericea Lespedeza- Sericea lespedeza is a perennial with erect stems up to 5ft tall and small hairs laying flat along the ridges on the stem. Flowering occurs from mid or late July to October and may be tinged with purple but always dry to yellow. The Franklin County Conservation District has historical aerial photos of Franklin County from 1966 and 1976 available for use in conducting environmental assessments. Newer photos are available through our computer system as well. The photos are available to view for $10.00 per site. The "per site" fee includes viewing photo of one location and receiving one black & white photo copy OR one digital copy (with surveyors camera) of the one specific site. Multiple maps of the same site are available for $3.00 each. Multiple sites will be charged multiple "per site" fees. Cash or check are the only two forms of payment accepted. Checks must be payable to the Franklin County Conservation District; and exact amount when paying with cash is greatly appreciated as we do not keep cash to make change in our office. The Conservation District only has one full time employee; so we recommend calling 785-241-7201 before you come in to confirm district staff is available to assist you with environmental assessment photos. Conservation District office hours are 8:00 AM until 4:30 PM Monday through Friday; with the exception of all Federal Holidays. The Franklin County Conservation District has a set of FEMA Flood Plain maps for Franklin County available in the office for public to view. 8.5" x 11" black and white copies are available for $3.00 each. Cash or check are the only two forms of payment accepted. Checks must be payable to the Franklin County Conservation District; and exact amount on the cash is greatly appreciated as we do not keep cash to make change in our office. The Conservation District only has one full time employee; so we recommend calling 785-241-7201 before you come in to confirm conservation district staff is available to assist you. Conservation District hours are8:00 AM until 4:30 PM Monday through Friday; with the exception of all Federal Holidays. While the conservation district is not regulatory and we do not offer any type of cost share/financial assistance programs for pond construction or maintenance we do provide the following information for landowners who are considering constructing a pond. What dams require a permit under state law? A dam regulated by DWR is defined as any artificial barrier, including its appurtenant works, with the ability to impound water, waste water or other liquids that has either: (a) a height of 25 feet or more; (b) a height of 6 feet or more and a storage volume at the top of the emergency spillway elevation of 50 or more acre feet. The height of a dam is determined from the lowest elevation of the streambed, downstream toe or outside limit of the dam to the elevation of the top of the dam. You should contact Division of Water Resources for additional information on state laws regarding permits to construct. Online at http://agriculture.ks.gov or the following takes you to a ﻿fact sheet about DWR permits﻿. Looking for information on aquatic plants and their control? Kansas State University Agricultural Experiment Station and Cooperative Extension Service have a publication available entitled "Aquatic Plants And Their Control" which covers topics such as classification of aquatic plants, identification, control and herbicides and their use for aquatic plants. This publication is available in pdf format at http://www.oznet.ksu.edu/library/crpsl2/c667.pdf paper copies, in limited supply, are available in the Conservation District Office. Since 2012 the Franklin County Conservation District has organized and hosted three tire collection days. Through these three single day events the Franklin County Conservation District collected 5,439 tires from Franklin County landowners and disposed of them in an environmentally responsible manner. We prevented 5,439 tires from ending up in the county road ditch, near by creek or the Marais des Cygnes River. This service accounted for 5,439 tires that the Franklin County Transfer Station did not have to handle, pay for or haul off. Not a penny of county tax dollars were used to fund any of the three collections! The Franklin County Conservation District foot the bill for the three collection days, which totaled $20,570. The funds came direct from our enterprise account. Our enterprise account holds revenue we have received over the years through the sale of grass seed and rental fees from our no till drill. While grass seed and equipment rental is available through the private sector, how many of those private entities would be willing to reinvest $20,000 back into the county? Seed sale revenue is also used when the Franklin County Conservation District upgrades our no-till drills. 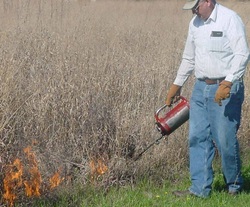 We have used funds from seed revenue to purchase and maintain drip torches which are available for landowners with burn permits to borrow free of charge for prescribed burns. Occasionally funds are also used to provide scholarship to youth for Range Youth Camp and for teachers to attend summer agriculture and environmental education classes.